“My interest is in the inherently transpersonal dimension of the psychoanalytic encounter itself. Contemporary approaches are, I believe, reaching toward the recognition that there are aspects of the psychoanalytic relationship that only a transpersonal context can contain. My purpose, therefore, is neither to highlight particular content which our patients bring in nor to supplement psychoanalytic theory with spiritual traditions. Rather, my hope is to expand the lens through which we view our work so that we are able to see more of what is already there. In this sense, the transpersonal dimension could be said to be “the unthought known” (Bollas, 1987) of psychoanalysis itself—that which lies beneath the surface of what can be expressed and so is deeply embedded in all that we do yet simultaneously is not within our consciousness. Having chosen as our professional activity the pursuit of the unknowable and the unthinkable, we must take the opportunity to explore that which in ourselves and in our field lies only on the cusp of awareness. theory (Figures 2-4) has moved progressively toward the notion that self and other cannot be so neatly delineated. Yet, as the diagram indicates, despite an increasingly nondualistic conceptualization of the relationship between self and other, the need to place a firm boundary (as represented by the solid line) somewhere characterizes all four models. 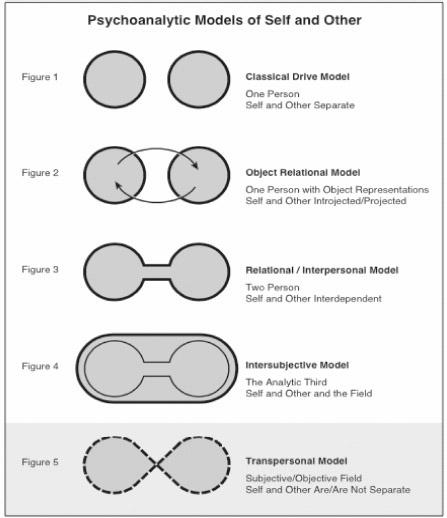 Even intersubjective approaches (Figure 4), with their attention to the permeability of the therapist’s subjective experience, maintain a boundaried notion of the field by focusing their lens on that which is created and evoked between therapist and patient, but not beyond them. And it is this need for a circumscribed view of selfhood—perhaps the most powerful remnant of both the classical ideal and the Newtonian world view within which it developed—that defines the edge of our current paradigm. For as long as our theory requires that the boundaries of the self must to some extent be absolute, it cannot adequately encompass the full range of the analytic mystery. Thus, while leading us into new territory, our theory is at the same time restricted in its capacity to describe the landscape. Figure 5 is an attempt to portray visually a model of selfhood that resists this need for certainty. Of course, such a model, like language itself, can never adequately convey the vast, mysterious, and indefinable nature of the transpersonal and so becomes inevitably reductionistic. I use it, therefore, primarily in an effort to highlight what is missing within the contemporary paradigm, specifically a model in which self and other, subject and object, both are and are not separate. The figure is meant to point to the radical leap involved in entering into transpersonal territory, namely, the willingness to move out of identification with the personal psyche alone. To be most accurate, these five figures, rather than being distinct, could be visualized as superimposed so that each is inherent in the other, reflecting a particular dimension of self-experience. The transpersonal, in other words, is not a separate dimension, as this figure might seem to imply. My purpose in delineating it is purely as a conceptual device so that we may examine more directly what is outside of the scope of our current theory. Within a transpersonal framework, then, we move beyond intersubjectivity into a larger and more encompassing field. While acknowledging that we can never escape the structures of our own subjectivity, the transpersonal paradigm points as well to an objective ground of being that requires our recognition. In the same way that, at a personal level, the self must move past its own omnipotence into an encounter with the externality of the object, at a transpersonal level, the personal self must encounter ontological otherness—that which is beyond the personal altogether. From this perspective, personal selfhood is not the center of the psychological universe but is, rather, an individual manifestation of the transpersonal ground of being that always exists apart from, yet informs, any individual identity. As a symbol of infinity itself, Figure 5 points to the inevitably paradoxical and dialectical relationship that exists between the limited, finite, and subjective self and the unlimited, infinite, and objective ground of being of which it partakes. Contemporary psychoanalytic theory, with its description of the field between patient and therapist as a “third” presence, acknowledges at an intersubjective level the need to orient toward something “other.” Within the literature examples abound of therapists who discover the surprisingly direct correspondence between that which arises within the field and the patient’s developmental requirements. Recent approaches have led us to recognize that the patient’s capacity to shed the deeply compelling patterns of his or her history depends on the therapist’s awareness of the field as well as his or her capacity to relate to whatever arises within it as inevitably meaningful.